A villain falls and the house rejoices. I don't think the words "too hard too fast" could describe this houseguest's gameplay - it was actually so much worse. Big Brother has a way of changing people. Some thrive in the chaotic landscape, emerging as leaders and strategists, while others falter, becoming too quiet or panicking under the pressure. It's a tough game to play and without a level head, you're bound to be walking out the door. 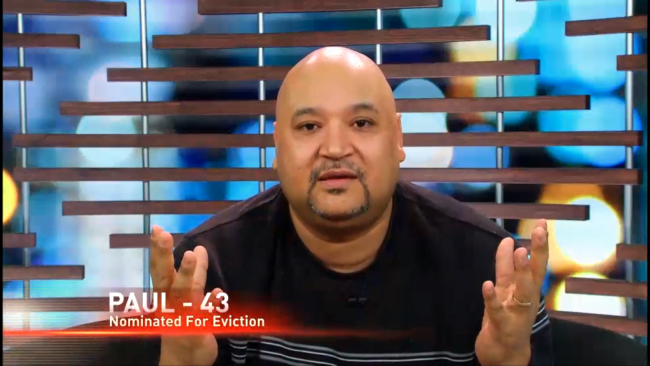 The third person evicted was Paul Jackson, the 43 year old motivational speaker from Toronto. Paul is the polarizing house villain who suffered a major power-trip after winning Head of Household (HOH) in the first week. His pursuit of power and controlling the game early on rubbed people the wrong way, causing the First Five alliance to plot his eviction. He was nominated in the second week against Neda but ultimately his ally Kyle was backdoored and evicted instead. Following Kyle's eviction Paul was nominated against Heather, this time by ally Ika in the hopes of appeasing the house, but a last minute change by the First Five sent him packing. On Day 22, he was evicted by a close vote of 6-4. Paul suffered the same fate that many fans and viewers have early on: he played the game to win in the first week. During the first HOH competition, Paul's big move to gain power was to offer immunity to the house in exchange for targeting only those who already jumped off. Already he ruined potential connections with half the house and while in power, his ego destroyed the remaining half. He did make connections with a few friends, like Adel and Kyle, but the opposing side was too powerful and everything Paul did, from calling Andrew a racist to making hurtful comments, kept adding a new nail to his coffin. Nothing could have saved Paul unless he won power. Nobody was talking to him except for Adel and Ika - the latter even placed him on the block! A change in temperament and staying out of the drama could have done Paul some good. He was a lightning rod for drama. Also, if Ika had not nominated him and targeted the REAL threats, it would have bought him another week. Paul is the type of houseguest who decided to play a "character" instead of being himself. In the course of a few weeks, he tried to be the strategist, villain, a teddy bear, and so much more. He tried to change too much and play all these characters to survive, especially as the house villain, before it destroyed his chances at winning. Big Brother is a three month process and playing hard right out of the gate can help to define alliances but in a majority of cases, it causes many early evictions and self-destruction.